Soup is a wonderful comfort food during the chilly winter months, but can be a nutritious time saver, too! 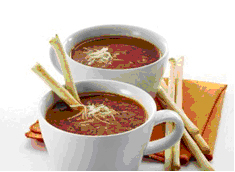 Look for recipes that use low sodium broth, a variety of vegetables, and herbs/spices instead of added salt for flavor. This soup is layered with flavor and gives all the simple steps to roasting tomatoes. Roast extra to save time for future meals, and use the oven wisely. Serve this with a crisp salad on a warmer night, or a toasted sandwich loaded with veggies on a cooler night – or enjoy a bowl as a snack. 1. In large saucepan or Dutch oven, heat oil over medium-high heat. Add onions and sauté until golden (about 8-10 minutes). Add garlic about half way through. 2. Add wine and reduce by half. 3. Add tomatoes and chicken broth; salt and pepper to taste. Bring to a boil. Reduce heat; simmer 25-30 minutes. 4. Add basil and vinegar; remove from heat. Serve with grated Parmesan cheese, if desired. Tip: Place tomatoes in a food processor and purée to desired consistency. Start with approximately 4 pounds of fresh vine ripe tomatoes, any variety. Rinse tomatoes and cut in half (lengthwise for Romas, crosswise for all other tomato varieties). Place tomato halves on baking sheets, face up. Drizzle with wild harvest® Organic Extra Virgin Olive Oil and sprinkle with wild harvest® Natural Sea Salt and wild Harvest® organic Black Pepper. Place in a 325°F oven for 2-3 hours. Tomatoes should have a wonderful caramelized appearance. Allow tomatoes to cool completely. Place desired quantity of cooled tomatoes in freezer-style recloseable food storage bags. Place in freezer. USE ORGANIC PRODUCTS WHENEVER POSSIBLE.